We've already discussed how evil carbs are in this article. Just to recap, carbs result in acute and chronically raised levels of insulin. Insulin is the chief fat-storing hormone in the body. Another (perhaps more important) role of insulin that few people know about is that it's also a powerful inhibitor of fat breakdown. Even if you restrict your calories and do lots of exercise so you are burning more calories than you are consuming, as long as your insulin levels are raised, your body will not be able to break down fat. Because insulin inhibits the very enzyme your body needs to break down fat – hormone sensitive lipase (HSL), and the enzyme your body needs to burn fat – CPT-1. Insulin resistance is a chronic condition that develops over time on a high carbohydrate diet. 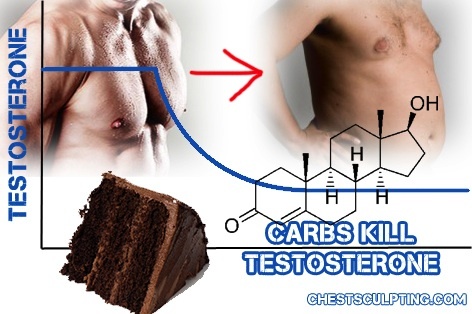 But more recently in the 91st Annual Meeting of the Endocrine Society in Washington D.C. in 2009, researchers presented findings that suggest it isn't just long-term insulin resistance that causes low testosterone, but that sugar directly reduces testosterone levels almost immediately after consumption. In the study, they found that downing a sugary drink can decrease your testosterone levels by up to 25%! Over 95% of the men in the study experienced lower testosterone levels that lasted for hours after a 75 gram glucose drink. It didn't matter whether the men had excellent insulin sensitivity, had insulin resistance or full-on diabetes, the results were the same regardless. So as I've already discussed, consider avoiding all carbs (except for fruits and vegetables, which are very micronutrient dense), especially refined carbs like white rice, white pasta, white spaghetti, cakes, biscuits, crackers, chocolate, cereals, donuts etc.